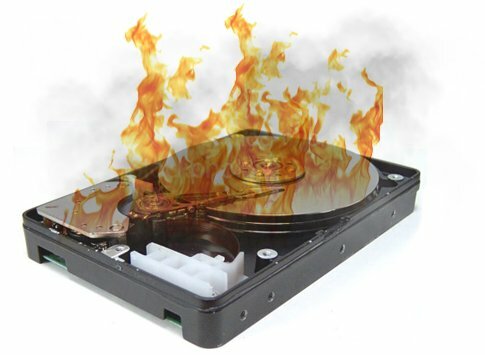 Burned Hard Disk Recovery – How Stellar Data Recovery Saved Clients Data! Have you ever encountered a situation in which you lost all the data saved on your computer due to fire in your office building? Although, in such case, the insurance can cover all the financial losses. But what happens to the data on your computer. The loss of information from system can have severe implications for your business. We now have data recovery services that can help to recover data from such situations. I am sharing my experience as Stellar helped me to recover data from a burned hard disk. Let me narrate the whole incident in detail. One fine day my office building caught fire. I went to see my office and horrified to see the situation. All the plastic components & electrical parts of computers were either melted or burnt. While the rest of the parts were struggling with the fire fighting tools such as sand and water. The loss was unbearable as I could see my hard work of years gone in a second. I went to my desk and saw my computer was damaged and the had a burned hard disk. Worried, I started thinking about the files of which I had the backup. As I was pondering over the financial loss, I was more worried about inaccessibility of data. My colleague informed me about Stellar data recovery services. The company provides professional data recovery services from all storage media devices. They specialise in recovering data from physically damaged hard drives. So we need not worry about data as they would try to recover the maximum. Then I searched about Stellar hard drive recovery services. It is one of the top recommended data recovery service providers in India. Stellar is in the field of data recovery for the past 25 years. I got in touch with Stellar and explained my case. The representative assured me that they could get data to recover from the burned hard disk. I was sceptic initially and submitted the burned hard drive for recovery. Stellar true to their name recovered data within 20 days. After a few days when office reopened, we got all our data back. I was thrilled and rejoiced as my business was back on track. I want to recommend to seek advice from professional data recovery service providers like Stellar. Stellar is ISO 9001:2015 & ISO/IEC 27001:2013 certified and follows “No Recovery No Charge” policy. Moreover, Stellar has its 15+ data recovery centres across India. And assures you up to 100% successful data recovery rate despite instance of data loss. Get in touch with Stellar Representatives in case of data loss from hard drives. How to Recover Data from Undetected Seagate External Hard Drive? How to Recover Files and Data From a Dead Hard Drive ? SSD Vs HDD – Which is a Best Storage Hard Drive? How to Fix and Recover Data from Cyclic Redundancy Check Error?